Order in the next 1 hour, 0 minutes an 56 seconds for same day shipping. Kit 3 (Includes Antique Linen, Vintage Photo, Walnut Stain & Black Soot). The addition of Mini Distress Ink Pads! Ranger has taken the same unique, water-based dye ink formula used inthe full size Distress Ink pads and has put it in a convenient stackable 1" x 1" pad. Mini Distress Ink Pads feature a raised felt pad making it easy to use on smaller craft projects. Pads can be easily re-inked with the coordinating Distress Ink Re-inker. The small size makes these pads quite convenient for projects on the go! Dont let the small size fool you. The Mini Distress Pad can be used in all the creative ways as their full size counterpart. Perfect to use with our new Mini Ink Blending Tool. 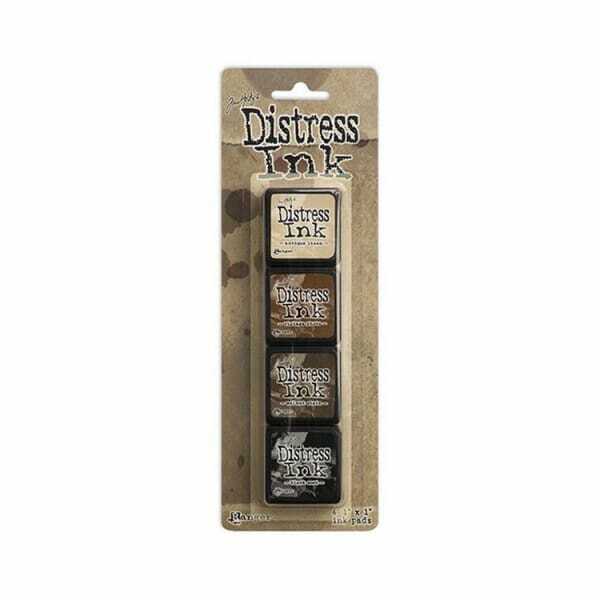 Customer evaluation for "Ranger Ink - Tim Holtz Distress Ink Minis Kit 3 - Sold in one strip of 4 pads"